Same great product. New website for your improved shopping experience. Soft Claws - The Purrfect Solution to Problem Cat Scratching. Also Available for Dogs - Great for Protecting Hardwood Floors. You can trim your cat's nails, supply scratching posts, cover your furniture with plastic and still you have cat-scratching problems. What to do? Declaw? Most people are looking for alternatives to this procedure and nail caps are the effective and humane alternative to declawing. Soft Claws (Soft Paws) nail caps for cats. Most importantly . . . They really work. Soft Claws effectively blunt the nails so virtually no damage occurs when cats scratch. 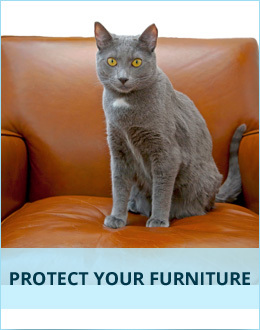 They protect furniture, screens, drapes and more. They also protect humans against scratches. Seniors, young children and those particularly sensitive to cat scratches can interact with their cats without the worry of being scratched. Economical - Each application lasts 4-6 weeks and there are 4 applications per kit so each kit lasts approximately 4-6 months. At about $19 per package, it's an inexpensive way to protect your loved ones and belongings. Comfy for cats - Most cats don't even realize they are wearing them. Soft Claws won't interfere with normal scratching and stretching behavior so cats can continue to scratch to their heart's content. They are safe and non-toxic and can be used long term without any negative effects. Easy to apply - Just add a few drops of the included adhesive to each cap and slide over the nail. Fashion bonus - Soft Claws come in a variety of colors (including clear) so you can keep it simple or be creative with color combinations. Remember, scratching is natural behavior for cats. You can't make them stop. Soft Claws is a practical, easy solution that allows you and your cat to be happy. For you dog people, Soft Claws is also available for dogs. Great for protecting hardwood floors from those problem dog scratches. Note: Soft Claws are so effective at blunting the nails that they should be used on indoor-only cats. Cats going outside need their claws to help defend themselves. 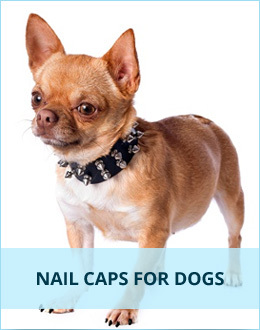 Soft Claws is also available for dogs. Great for protecting hardwood floors from those problem dog scratches as well as protecting doors and screens. 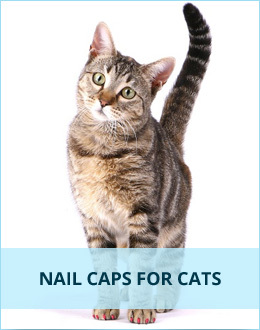 And like with the cat nail caps, they also help protect humans against scratches. Seniors, young children and those particularly sensitive to dog scratches can interact with their dogs without worrying about getting scratched. Perfect for small dogs that like to cuddle.